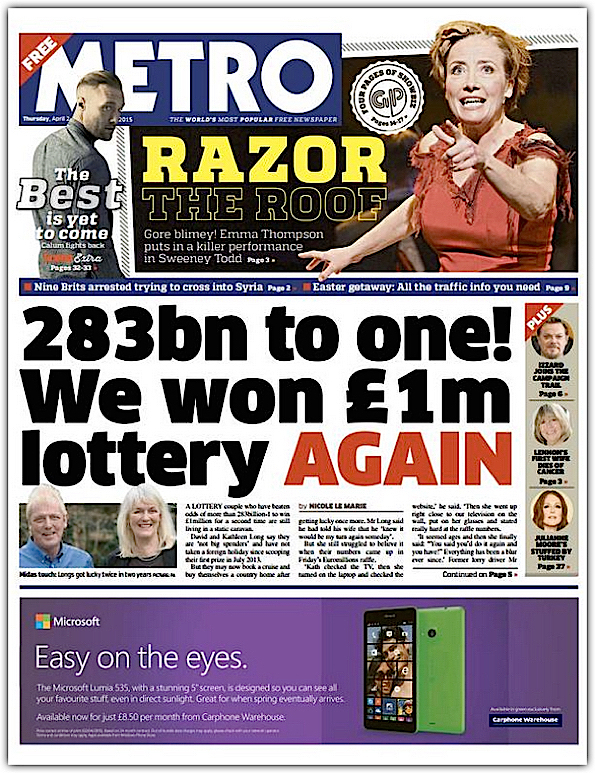 A British couple beat the odds of billions to one when they hit the EuroMillions jackpot - again - just 20 months later. David Long said he was 'shocked' to win again. He had continued buying a ticket after their first million-pound win because "I just knew it would be my turn again some day." The former lorry driver said he was shocked at the double win of £1 million (US$1.48M), and now intends to buy a mansion. Their win made front page headlines in many British newspapers. Mr Long, who has been previously married, said: "We don't have a champagne lifestyle. We still live in a mobile home. We've been there for 13 years in our static caravan." "That's changed now though, we are planning on moving somewhere else. We've had a bit of luck. It doesn't have to be a big mansion, it just has to have a games room and a bar for me." David Long always said he would win again, and the premonition came true. This win is quite unique, because the odds of 283 billion to one are higher than being hit by an asteroid (79 million to one), or being eaten by a shark (four million to one). Mr Long said to the Daily Mail: "I tend to play when I know there are lots of prizes on the go." "Last time I knew I had a good chance because there were 100 prizes of £1 million. Last Friday night I was passing the local shop and saw there were 10 £1 million prizes on EuroMillions and a nice car and thought yeah I'll give that a go." "Got to be worth a few lines... and I got five using my usual numbers." The Longs decided they will shift from their modest home in Scunthorpe to a mansion. While it's uncommon to have these wins frequently, it has happened before. A Bergen County, USA, man did exactly this. John Roland won $292,935 twice, with each ticket having the identical numbers: 11-15-16-20-28. "I told the clerk my numbers for the first ticket," he says. "Then I filled out another bet slip with the same numbers and three other sets of numbers." Since there was a third ticket sold in Ocean County with all the winning numbers, Roland claimed two-thirds of the jackpot. Had he bought just one ticket he would have won half. What Astonishing Secret Gave This Lottery Winning Couple TWO Million-Dollar Wins?